Anxiety is probably one of the world’s worst diseases. It is difficult to put up with and can often ruin your chances of living a healthy lifestyle. People who suffer with anxiety should always stick to working in those conditions that don’t stress them out too much. An environment that is calm and in peace is always best for them. Therefore we will never suggest you or someone who has anxiety disorders to work as a lawyer or maybe even for a corporate company. Nonetheless, we have some amazing job ideas for people who are suffering with anxiety or even anxiety disorders. The jobs which suits best for this type of disorder, helps turn your biggest weakness as your strength. The peopel who have GAD , generalized anxiety disorder have the tendency to over anlayze everthing and overthink. Fortunately these features help your do these jobs effectively. Household jobs are certainly less stressful. Plus the variety is endless. You could become a housekeeper, dishwasher, plumber etc. The good part is that jobs like these actually pay you quite well apart from the dishwasher. Plumbers and housekeepers have been making a whole lot of money these days. But if you want to go for something sophisticated, we suggest you try finance writing, infographic design, contract drafting, electronic engineers etc. If you think you can pull off a couple of good tunes, try voice talent. There are many singers who work from a home studio and send you files online or electronically. If you are too anxious or stressed out, becoming a factor helper would be absolutely ideal for you. This job will also give you a wide number of options. The only thing is that during the entry level you might not get enough variety since most of the jobs are too repetitive. But don’t worry! That will be taken care of by the time you continue to advance. The best part about this job is that you don’t have to deal with any sort of customer interaction. That would definitely keep anxiety and stress at bay. You will be spending a lot of time with your life and will be left to your own devices. A second career option we could recommend you to try is one of a cleaner. Now this job is quite simple. All you have to do is keep things clean and tidy. You can vacuum carpets, empty bins, clean bathrooms and kitchens. Even though this doesn’t sound like a very glamorous job, it is good for those who are highly stressed. First of all, it will keep you several miles away from people so that you don’t have to interact with them and secondly you don’t have to deal with any kind of pressure that people often deal with at work places. Managerial or management related work is absolutely ideal for stressed people. You are expected to handle the general functions of a manager in order to handle an organization. Most of your work will consist of supervision, setting goals for the employees, hiring and instructing a new set of people every now and then. You can handle the performance data and review it too. None of this will make you feel too stressed. Plus all you will really need is a bachelor’s degree and some knowledge on strategic planning. A computer programmer’s job is often quite simple. All of you have to do is prepare a few documentations and handle some software. That’s it. You will be spending a lot of time in front of the computer and very little time with people. That gives you enough space and time of your own. However you will require some field of study before you finally decide to get into it. You also might have to work for long hours and even put up with deadlines. The good part is that the job gives you enough flexibility. Being self employed is also quite a good option to go for. You will be getting a whole lot of freedom and you can choose to do what you want to. There is no boss involved here which means you don’t have to put up with a whole lot insane pressure. However the minus points are that there is no financial security involved. You might have to struggle quite a bit before you become successful in life. Plus there is no guarantee that you will be successful since business is always slow. A brilliant option for you could also be one of a writer. Writing has been the dream job for many people. If you work for websites online, you can literally sit at home and write as much as you like. You will be making some good money in the whole process. Plus you will have enough freedom. There will be less interaction with people which means you won’t have to deal with stress and anxiety, something that happens quite often when you are at work. Plus freelance work will always boost more confidence and help you become a published author in the future. If you love dogs, then a dog trainer would be a fine job opportunity for you. Here you will only have to deal with dogs which mean less human interaction all over again. Dog trainers are those People who enjoy working with animals will definitely enjoy this one. There are other options that fall under this category such as veterinary technician, kennel operator and zoo keeper. However you need to have some training, study and certificates if you want to become any of these. Plus the salary is quite decent which means the money is taken care of. Another job we could definitely offer you is one of an accountant. Here all you will be expected to do is manage book keeping. You will have to take down financial details and take care of business. That’s about it. It doesn’t matter whether you work for a company or even for a private accountant, there will be some level or some amount of work that will expect you to interact with others. So you should just continue to focus and work on your job so that your comfort level increases over time. Landscapers have been in the business for very long and we can assure you these guys don’t have to deal with any kind of pressure. So if you know someone who loves nature and is suffering with anxiety disorder at the time, this job would be absolutely perfect for you. Landscapers are usually expected to work with private companies or golf companies. It doesn’t require you to work in some kind of office environment either. Plus you get paid well for jobs like these. However if you want to own a landscaping company of your own, make sure you are well versed with communications and computers. Entrepreneurs have been making a whole lot of money in the business so far and you could too. You can set your own schedules and take care of your own responsibilities. Plus you will be having total control over yourself which means no boss and no other extra problems that come when dealing with one. The only problem is that you will have to deal with customers. If that is too stressful, you could always hire someone and manage your expenses. You are always free to hire people to do those kinds of jobs that you don’t fancy. A counsellor is also known as a therapist. Even though this isnt the first job you should choose if you suffer with social anxiety, this is also a very good option. Here you will have the chance to deal and understand what other people are going through. You can always empathize with them and pull them out of their problems. If you are receiving treatment currently to overcome social anxiety, you are definitely in a good position to help others. Even though some people think this is a horrible career option, we can definitely give you some reasons why it’s not. Taking care of children will become much easier of you have everything planned and sorted out from before. You can plan your own schedule and work things accordingly. You may also spend some time alone with the kids, something you usually don’t get when others are around. Plus you will find flexibility here, something you definitely don’t find with other jobs. However you have to make sure you’ve become too isolated or stop your children from enjoying themselves because of the social fears you are currently dealing with. Actually, there is a link between working from home and jobs for anxiety. Now before moving to the list of jobs, let us clear the clouds around the link. The best part about work from home, is that they don’t have to deal with the outside world. 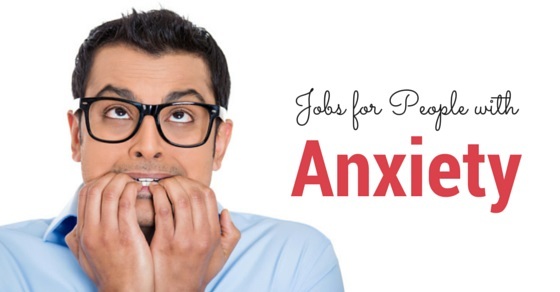 This covers the list of jobs you could do especially if you are anxious. If you know someone suffering with social anxious disorders, do recommend this to them. Plus you can always search online for more options. We are sure there is something out there for you so do not lose hope at all. Keep working at your goals and continue with your search and you will definitely find something. On that note, good luck. Previous articleFine Feathers Make Fine Birds: How to Dress Professionally? Next articleHow to Promote Gender Equality in the Workplace?